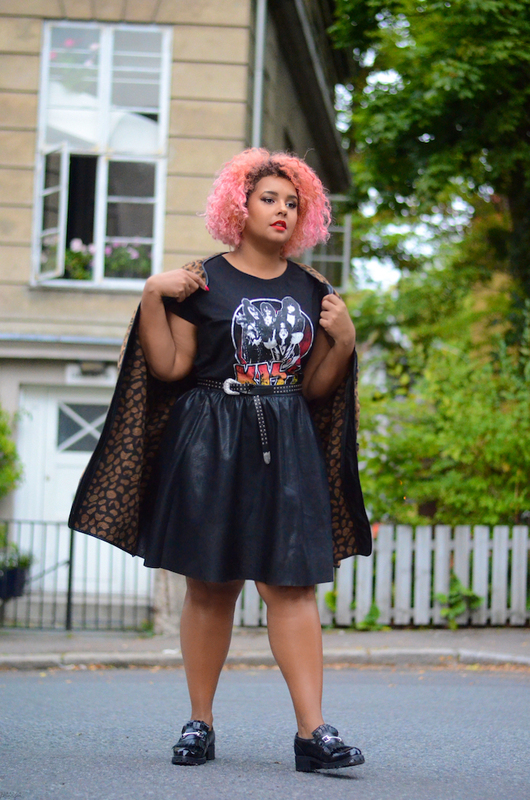 I‘m sharing a cool collab with beautiful Gisella Francesca today. We are both Zizzi brand ambassadors and we decided to team-up together. Yeahh ! The fun part is: Gisella is based in Norway and I’m from The Netherlands. We decided to compliment the Kiss t-shirt into our own personal style, without any knowledge how the other girl would style her T-shirt. It’s funny how we both ended up combining our Kiss t-shirt with a faux leather skirt. When it comes to style, …Gisella always has an exceptional eye on how to blend different prints and patterns into one outfit. She decided to mix and match her leopard coat with classic patent shoes. A perfect way to keep up the edge in her style, don’t you think? Although Gisella and I wear the same size, we have different body shapes. I’m more an inverted triangle shape while Gisella has more of an hourglass body. It’s always important to shop your shape and not your size. Being the same size but not having the same body type also proves that we are beautiful, in our own way. We both want women to feel free to wear what they want. It’s fun to see how the same t-shirt fits so well on both of us. 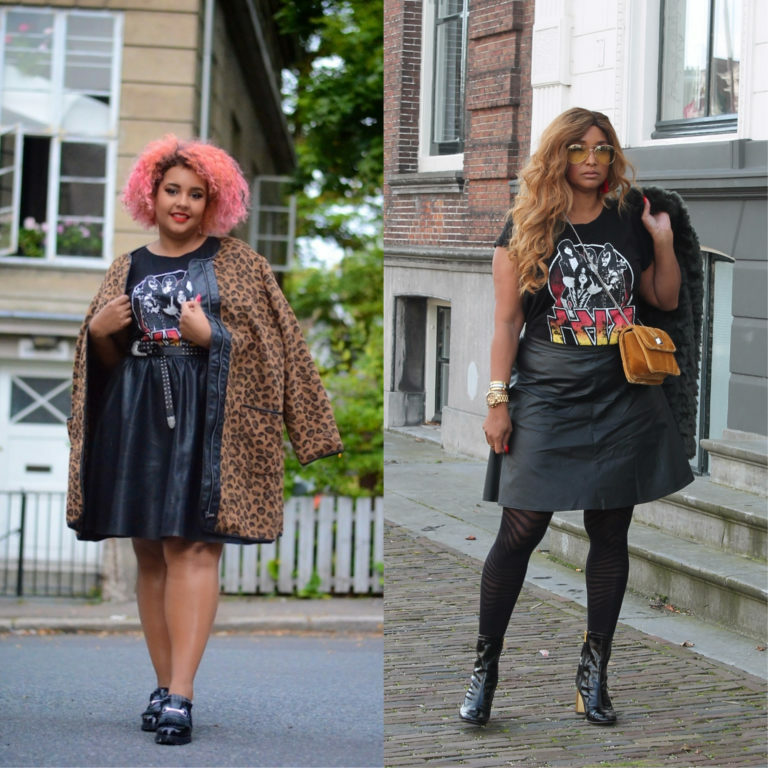 Fashion should be for all women regardless of the size they wear. As soon as I laid my eyes on this T-shirt I was hooked. I wanted it so badly you can’t even imagine. The reason why? You can’t go wrong with a statement T-shirt, and It’s a KISS t-shirt!! The look I created is very feminine. I just love A-line skirts because they suit me so well. I have wider hipes and fuller upper legs, therefore A-line skirts are just perfect for my body type. Because the weather in The Netherlands is transforming and it’s getting colder, I decided to go for stockings with a fun print. I love to play with prints too, just like Gisella. There are so many ways to mix and match prints and styles, you just have to find a way to get around it. Don’t forget fun accesories to spice up your outfit. I’m wearing an ochre yellow cross-body bag as an eye-chatcher. Details are everything. We hope to inspire all women to re-claim and love their bodies. We are women with shapes that are our own. Let’s show the world that we are beautiful, bold and want to wear fashion too. 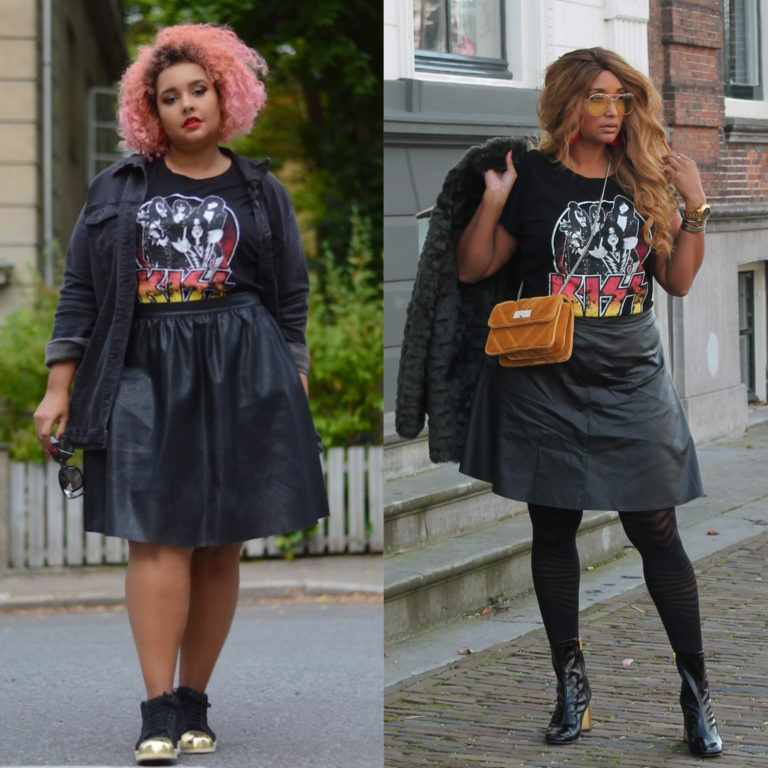 Beauty comes in all shapes and sizes, rock your confidence! Let’s celebrate diversity and be unforgettable, just like this Kiss T-shirt. I hope you liked this post, if you have any questions or comments, don’t hesitate to let me know. Let’s share our love for fashion and keep the conversation going. The clothes I am wearing have been sponsored by Zizzi, opinions are always my own.